The participants received their certificates from the Third Secretary to the Australian High Commission, William Ewing, who officiated at the closing ceremony. The participants along with SIFF Just Play instructors and staff were present to witness the presentation of certificates. Ewing congratulated the teachers for their achievement and called upon them to ensure that their students share in the enjoyment of Just Play when they return to their schools and communities. One of the course participants, Moore Davis, spoke on behalf of the participants and he thanked the Australian government for supporting Just Play. “I would like to expressly thank the Australian government for being a part of Just Play. It is a great program which helps us to enrich the social environment for our children and we are very happy to be a part of it as well,” Davis says. As part of the workshop the teachers underwent training on how to use the Just Play manual to conduct football sessions for young children in schools and communities. The first day featured both theoretical sessions and practical ones which enabled the participants to try out their knowledge on the pitch. The second day featured more practical sessions and the training was wrapped up with the Just Play tournament involving forty plus children. The objective of the tournament was for the teacher to practice how to organise Just Play games with a large number of children. Chris Asipara, the lead instructor during the workshop and his assistant, Gabriel Riotarau, were on hand to provide guidance for the participants. With their training completed the participants will be issued with Just Play training equipment which includes balls, bibs and the training manual along with other gear like whistles, cones and bibs. The materials will be used in a 6-week implementation program to be conducted by the participants in their school or community. The SIFF special projects office will closely monitor the implementation program and provide technical support. Commenting on the success of the last 2 days SIFF special projects manager, Phillip Ohoto’ona, says that his office has been closely monitoring how the workshop panned out and he is happy with the results. “We learnt many lessons last year and we have improved our approach to delivering this training and this has helped us enable effective communication with the participants on the technical aspects of Just Play and also with the goals of the program. I believe that the first 2 days have been almost perfect and they will surely set the pace for the next 12 months,” Ohoto’ona says. One of the main improvements has been with the instructor to participant ratio which was quite high in past training workshops and this made the job of the trainers difficult. The approach for 2011 is based on quality of delivery and this has resulted in the grouping of participants into smaller units which are more manageable. Already, some benefits have been showing such as shorter time in the theory sessions and lesser instructor intervention in the practical sessions. Ohoto’ona also thanked the Australian Government for sponsoring Just Play but also reserved praise for their high commission office which closely followed the progress of the program since it was launched in 2010. 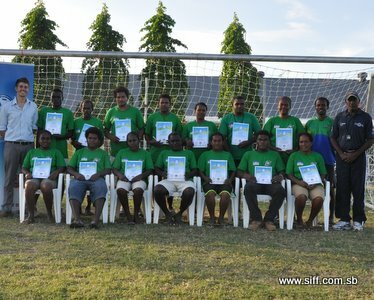 “Having someone like William Ewing, who represents the major sponsor of Just Play in Solomon Islands, here is a big morale booster for the participants and for us at SIFF who manage this very important project. This way they can see directly the work that we do and the results that are manifesting in the community,” Ohoto’ona says. Two (2) more training workshops remain before the scheduled training for Honiara schools is completed. After the completion of the schedule for Honiara the training under the second phase of Just Play will move out to the provinces.